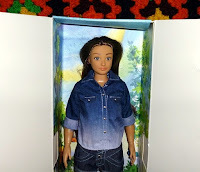 Last Christmas I received a Lottie doll, which sparked my interest in dolls again, and led to some research on the best ways to photograph them. 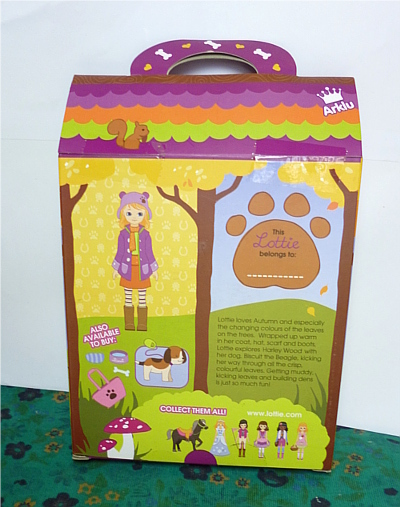 I tried it out with a simple background and using my daylight lamp, for the unboxing of my Lottie Autumn Leaves doll. Actually, I've had this doll for a while. I first saw it when I was looking up Lammily doll reviews, and saw a photo of them together. I immediately thought, "Emmy needs a little sister!" At the time, the only source I could find in Australia was an online shop called Gumnut Toys, though I believe they are available in department stores now. 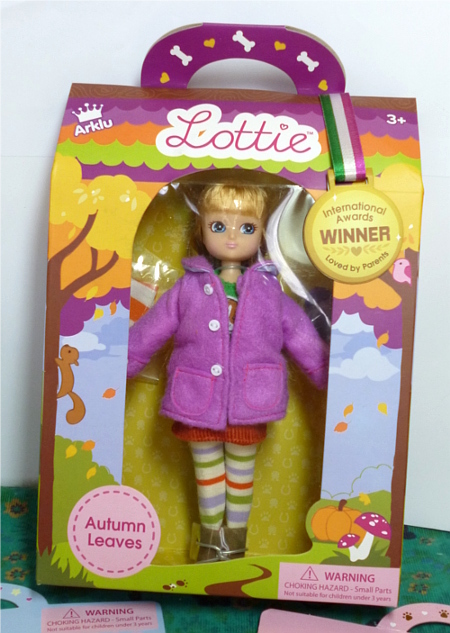 The Autumn Leaves Lottie is one of the earliest produced. The later versions are more diverse and have more defined themes (such as the Fossil Collector Lottie I'll be reviewing in future). I chose Autumn Leaves mainly because of the clothes, but also because of the hair colour. 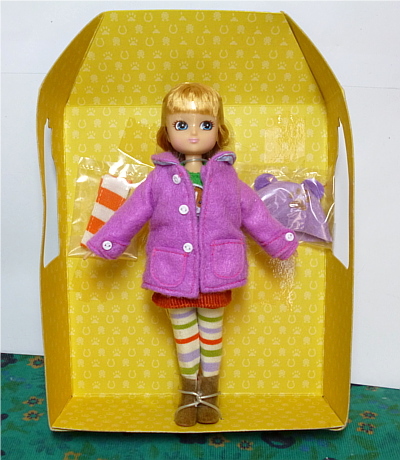 As you can see, the Lottie doll is boxed in a carrier-style cardboard box with a handle. There are windows in the front and sides through which to view the doll. 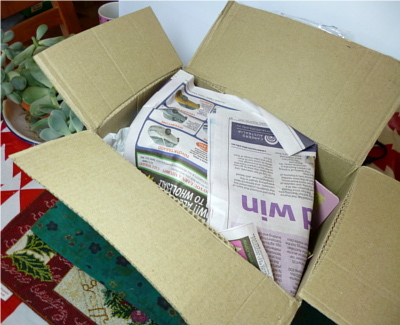 The box can be opened without damaging it, and can be re-used as a carrier for the doll and her accessories. On the back, there's a short but cute story about walking through the forest. As I was lifting the doll out of the box, I suddenly knew her name would be Alice. 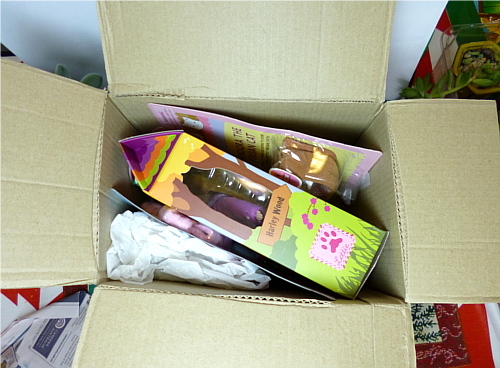 Unboxing a doll and naming it is such a magical experience: I understand why people have such large collections! Alice was attached to the backing board with twist ties and plastic around her forehead, and her accessories came in little plastic bags attached to the backing board. Alice's coat was held closed with a stitch which I had to cut. I was worried I would damage her coat in the process as it was a delicate operation. A child certainly could not have unboxed the doll without help. 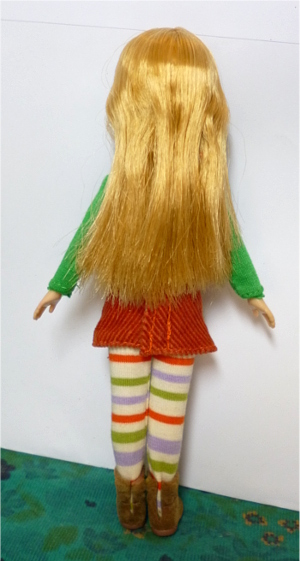 The Lottie doll stands 18cm (7 inches) tall. 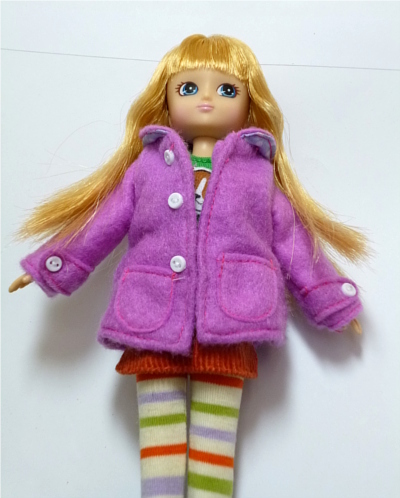 According to the manufacturer, the doll's body is modelled after that of a 9-year-old child. Aside from the head, her proportions are realistic. Her head and eyes are slightly large in proportion to her body, but not enough to be very noticeable. The head moves from side to side, the shoulders and hips have ball joints and the knees have click joints. 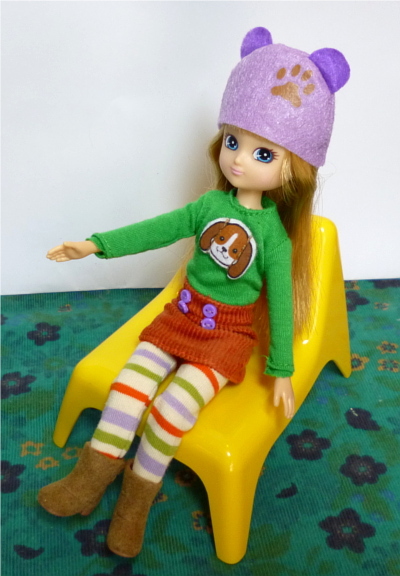 She can sit with her legs straight out in front of her, unlike the Lammily doll. She can stand up with shoes on, but not very well barefoot. The overall shape of the body is very elegant. Alice's hair is soft and silky and lovely to the touch. It's a little crinkled from the twist tie around her neck, but hopefully that will drop out over time. Alice's face is just darling, and I love looking at it. 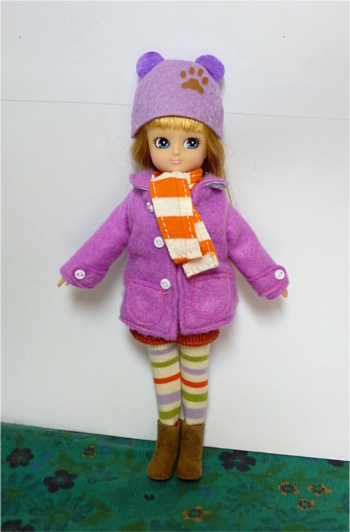 It reminded me of another doll I'd seen -- the Licca-Chan doll from Japan. I don't have one ... yet! It's on my wishlist. Alice's clothes are just beautiful, with different textures and fine details like tiny buttons. The coat is lined with a blue polkadot fabric. All of the clothes are very well made. They fasten with velcro and are very easy to put on and take off. The adorable flocked boots have a split in the back so they are also easy to remove. Many of the clothes in the Lottie range have a cohesive style -- with leggings, mixed bright colours, stripes and cute motifs on the tops. The motif on Alice's jumper is attached with velcro, allowing it to be swapped with others in the range. I thought this was a clever and a really cute detail. In the later dolls in the range however, the motifs are printed on. It's a shame that they can't be swapped, but on the other hand I guess I could make my own motifs for Alice. The only piece of clothing I don't like is the hat. The concept of the hat is very cute, with its animal ears. However, it's made of stiff felt and sits high up on Alice's head. The printed paw motif is set off to one side, and that irks me. At first I thought it was a mistake, but when I saw photos of other dolls online, they were all the same. I wish the motif had been in the centre of the front instead of offset like that. The colour is very similar to, but not quite the same as the coat, which looks rather strange. 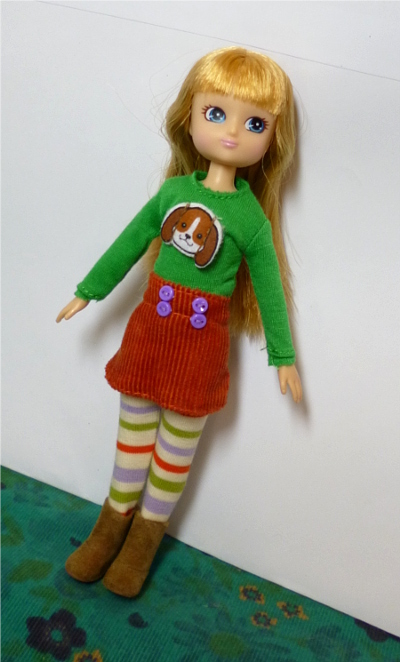 It's only a small niggle though, and overall I love my Lottie doll to bits. I can't wait to unbox her sister! 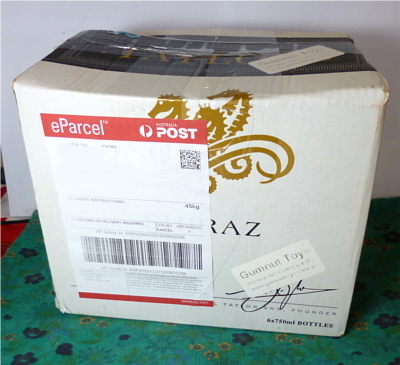 As I mentioned in the beginning, I ordered my Lottie from Gumnut Toys, which is a small, Australian family-run company selling educational and wholesome toys. I've placed several orders with them and my experiences have been 100% positive. They are my Lottie provider of choice!